Speaking of climate change, one of the best ways of reducing carbon emissions is to implement a cap-and-trade scheme. Basically, the government sets a nationwide cap for carbon emissions and then auctions off permits on a quarterly basis. Companies can buy permits at auction, and they can later trade them on the open market as their needs vary. The government caps and companies trade. It’s a pretty elegant solution to reining in carbon pollution. The ETS handed out far too many pollution allowances between 2005 and 2007, which caused carbon prices to collapse….Meanwhile, some electric utilities received free pollution permits and were able to earn “windfall profits” from their good fortune. That appears to have been an error, too. There’s also the potential for fraud within the system. In theory, companies can get a pass on their pollution by buying carbon offsets—paying for projects elsewhere that reduce carbon, such as planting trees in Brazil. But these programs are often criticized for poor oversight (and some of them might have happened anyway). That needs to be reformed, too. These are the kinds of problems any big new program has, and they’re being ironed out over time. But let’s look at the bigger picture: has ETS cut carbon emissions? The latest “Results and Lessons Learned” report from the Environmental Defense Fund has the answer. 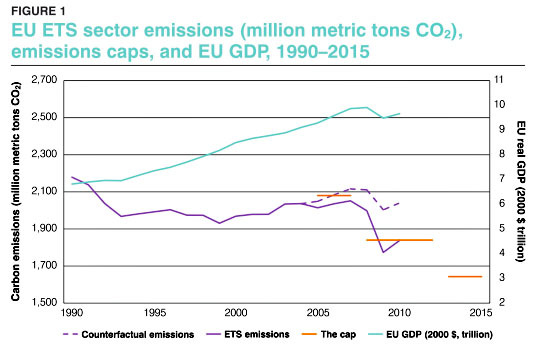 Without ETS, total European emissions would currently be around 2 billion metric tons per year. With ETS, emissions are around 1.8 billion metric tons. Still too much, but headed in the right direction. This stuff isn’t pie in the sky. We could do it if we wanted to.